Who are the Firebrands, and who supplied them with the flame-spewing rocket suits they use to perform their dastardly crimes? In this introductory role-playing adventure by Villains & Vigilantes co-creator Jeff Dee, players are superheroes on the trail of Intercrime - a world-spanning criminal syndicate! 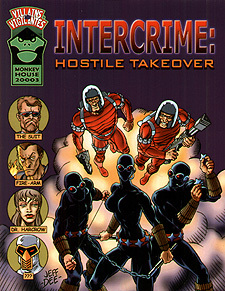 This book provides information on Intercrime, the major criminal organization of the V&V universe. The first section describes Intercrime's organizations structure, personnel, and operations. The remainder of this book is a complete introductory adventure for a team of 4-6 beginning characters, introducing the players to Intercrime and giving them an opportunity to take out a local Intercrime base! This adventure requires the Villains and Vigilantes 2.1 rulebook.